Hi friends! I hope you're well! It's raining here so hopefully, I will be up to getting out and about soon or my children will go STIR CRAZY! Next week is spring break, so let's REALLY hope that the weather is better by then. And today, I wanted to reveal the whole project. I made this for the Moxie Fab World Paper Scraps challenge. I used all the scraps from my Sunday Afternoon Kit from Paper Made Bakery. I still have TONS of paper left but I wanted to use up my scraps. The chalkboard is from Darice, I got it at Joann Fabrics. I punched 1 inch squares from my scraps. 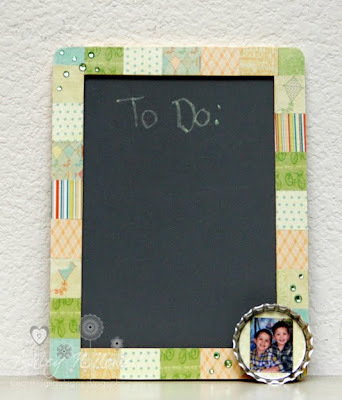 I used Mod Podge to put it on the wood around the chalkboard and then I trimmed off the excess. I painted a layer of Mod Podge over the top. I took the bottle cap embellishment and die cut a circle from some of the same Webster's Pages Sunday Afternoon paper. I added a picture of the kids that came free with Brady's school pictures. Then I glued it to the chalkboard and added some gems, also from the kit. What a cool project!! 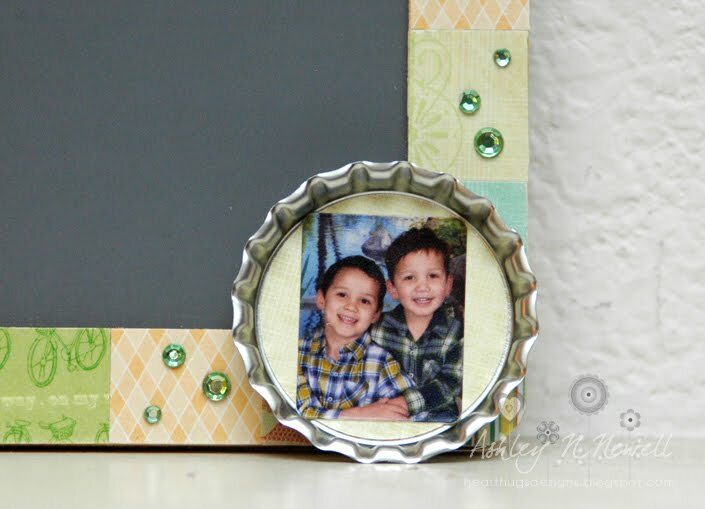 Great way to use up scraps, too. Congrats on being featured on Kate's IHP blog!! FAB! I love how you have used your scraps.